Write a Concerto for Orchestra and you're going to have the ghosts of Bartók and Lutosławski looking over your shoulders – not necessarily an enviable position for American composer Jennifer Higdon, who was born in 1962, and who studied, among other places, at the Curtis Institute in Philadelphia. (This was a commission by the Philadelphia Orchestra in honor of its centennial in 2002.) Higdon does a nice job, however, of both acknowledging her forebears and of bringing a characteristically American flavor to this genre. What is it that makes music sound American? Part of the answer comes from American speech: its choppy rhythms and its tendency towards grandiosity and hyperbole were reflected in the music of composers such as Copland, Piston, and Bernstein, and those same qualities appear in Higdon's music. Her Concerto for Orchestra, as one might expect from that genre, is intentionally a showpiece for the symphony orchestra and its various components. Strings take over in the second movement, for example, and the percussion instruments have their say in the fourth movement. In the middle movement, a "keystone in the work's overall arch" of five movements (the description comes from Nick Jones's booklet annotations), the orchestra's principal players each get a solo before Higdon gives the strings, woodwinds, and brass an opportunity to play on their own. Higdon is essentially a traditionalist. This is modern music that season subscribers will swallow without much difficulty. Even though the Concerto for Orchestra is not remarkable for its melodic content, there is so much color and brilliance in Higdon's writing, such industriousness and optimism, that few listeners will notice, let alone care that the work is not very deep – certainly not as deep as the those alluded to in the opening sentences of this review. 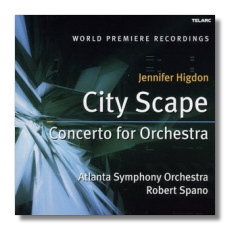 City Scape was commissioned by the Atlanta Symphony Orchestra, and it received its première five months after the Concerto for Orchestra. The city in question is Atlanta, and the three movements are "SkyLine," "river sings a song to trees," and "Peachtree Street." Higdon has eschewed picture-postcard music in favor of a more abstract style. Indeed, "SkyLine" sounds exactly like it could have come from the previous work – a bit of a miscalculation in putting this CD together, I fear. The long middle movement is quite magical as it takes us into a different sound world, and here Higdon's heart opens up in an efflux of emotional melody. The final movement is a busy, positive-minded rondo, and a fair enough representation of Atlanta's main thoroughfare. Higdon appears to have been at the recording sessions, and given the polish and drive of the Atlantans, this pair of world première recordings will likely remain definitive, even if another orchestra decides to give these works a try. 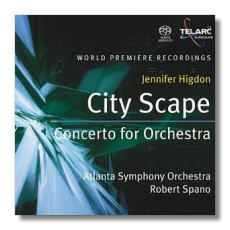 Spano's still small discography remains strong, and Telarc's long association with this orchestra has yielded the expected audiophile-pleasing results.